Discover the natural beauty in Chicago's green spaces, from Millennium Park to urban gardens to neighborhood nature sanctuaries. For more than 175 years, the Latin phrase Urbs in Horto (which translates to "City in a Garden") has been Chicago&apos;s official motto put forth on the city seal. With more than 8,100 acres of parkland, 50 natural areas, 26 miles of lakefront and 2 world-class conservatories, the city truly lives up to this tenet. Let downtown&apos;s soaring skyscrapers and the city&apos;s colorful neighborhoods be your backdrop as you discover the natural beauty that lies among Chicago&apos;s manmade wonders. At the heart of Chicago&apos;s downtown Loop, Grant Park covers over 300 acres along Lake Michigan with beautifully landscaped green space. Often referred to as "Chicago&apos;s front yard," its many open lawns, fields and gardens offer plenty of room to play and relax. Formal, ornamental beds bloom throughout Grant Park such as the Spirit of Music Garden and Cancer Survivor&apos;s Garden while the park&apos;s showpiece, Clarence Buckingham Memorial Fountain (301 S. Columbus Drive), provides a monumental focal point with the lakefront on one side and the skyline to the other. 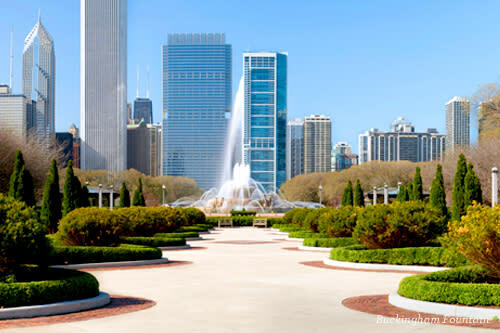 Other park treasures include various public art pieces, the Art Institute of Chicago and Museum Campus, Petrillo Music Shell, two boat harbors and of course, Millennium Park, which makes up its northwest corner. Since its 2004 debut, Millennium Park (201 E. Randolph Street) has become one of the most popular destinations in Chicago. Among the many public art sculptures and the spectacular Jay Pritzker Pavilion sits the Lurie Garden. Designed by Gustafson Guthrie Nichols Ltd., Piet Oudolf and Robert Israel, this 2.5-acre garden was inspired by Chicago&apos;s long-ago transformation from its flat, marshy origins to a bold, powerful city. Look up at the striking 15-foot-high "shoulder hedge" which represents poet Carl Sandburg&apos;s famous description of the "City of Big Shoulders" and encloses the garden on two sides, protecting the delicate perennial garden. A graceful hardwood footbridge over shallow water divides the garden diagonally between "light" and "dark" plates of perennial plants. Another urban oasis in Chicago is Lincoln Park (2045 N. Lincoln Pak West), located just north of downtown. Extending nearly 7 miles in length and stretching over 1,200 acres along the lakefront, it is larger than both New York&apos;s Central Park and San Francisco&apos;s Golden Gate Park, and is the city&apos;s largest park. 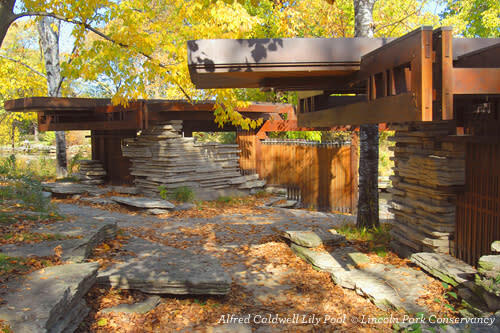 Nature lovers seek tranquility in the Alfred Caldwell Lily Pool (2400 N. Cannon Drive), a historic landmark where you can walk the stone surround, listen to the trickle of water falling and watch the butterflies and birds flutter to and fro. 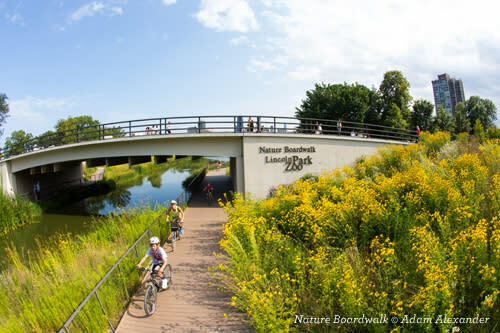 And for recreation, the opportunities in Lincoln Park are endless with beaches, boating and the Lakefront Bike Path, which connects to the other parks along the scenic shoreline. Nature Boardwalk at Lincoln Park Zoo is an environmental classroom like no other in the city. Peaceful quiet in some sections and buzzing with life in others, the ecological habitat is a haven for native birds, frogs, fish, turtles, insects and more. Zig and zag along the wooded boardwalk through the 14 acres surrounding the South Pond ecosystem to see this slice of prairie in the big city. Also in Lincoln Park, the Peggy Notebaert Nature Museum (2430 N. Cannon Drive) is a family-friendly urban gateway to nature and science. Indoors, visit the Judy Istock Butterfly Haven where over 75 exotic species roam free in the greenhouse or head up to the rooftop Micole Bird Walk for a bird&apos;s eye view of what else? Birds! And to see the museum&apos;s largest permanent exhibit, you merely have to look around its front yard. No admission is required for Nature Trails, a pathway one-third of a mile long around the Notebaert that opens up into savannahs, woodlands, a butterfly garden and more. A restored prairie and pond just beyond the nature museum, North Pond Nature Sanctuary (2400 N. Stockton Drive) is another peaceful park spot. Connect with native plant life and wildlife, as its home to turtles, frogs, rabbits, waterfowl and over 200 species of resident and migratory birds. Chicago boasts two beautiful conservatories, both free and open daily. 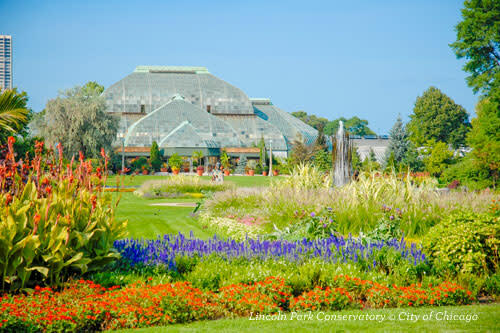 Breathe in the fragrant air while you meander through the Lincoln Park Conservatory (2391 N. Stockton Drive), a Victorian-era "paradise under glass" whose collections include the lush Fern Room, Palm House, Orchid House and Show House. Or go exploring the century-old Garfield Park Conservatory (300 N. Central Park Avenue) located on the city&apos;s West Side. It is one of the largest in the country with six multi-faceted greenhouses and two grand exhibition halls. Each of the sister conservatories bloom year-round, but also check the calendar to catch one of their seasonal flower-garden shows. In Chicago&apos;s Chinatown, a picturesque 12-acre park hugs the south branch of the Chicago River on what was originally an old rail yard. Somewhat hidden in the shadows of highways, freight crossings and El tracks, Ping Tom Memorial Park (300 W. 19th Street) adds the serenity of Chinese-inspired design to an industrial side of the city with a traditional pagoda-style pavilion, ornamental railings and etched columns. Take advantage of the views along the riverbanks to check out the landmark vertical lift bridge in the horizon or hop on a water taxi for a uniquely Chicago experience. Surround yourself with the waters of Lake Michigan and get lost in wild prairie grasses at Northerly Island (1200 S. Linn White Drive). This 91-acre peninsula dedicated to nature juts out into the water just south of the Loop, offering uninterrupted views of the skyline and a peaceful respite from the hustle and bustle of the city. Chicago&apos;s South Side has a peninsula of its own within the sprawling 600-acre Burnham Park (5491 S. Shore Drive) along the lakefront. 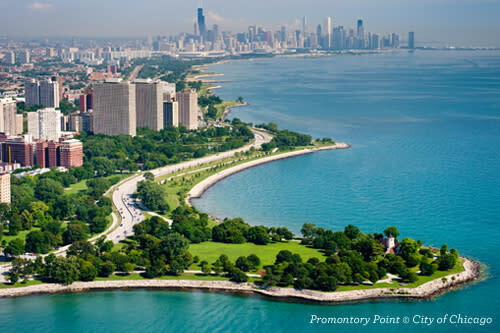 Making up the park&apos;s southernmost end is Promontory Point — envisioned by renowned designer Daniel Burnham in his 1909 Plan of Chicago and later designed by great landscape architect Alfred Caldwell. It is another excellent lookout spot to see the skyline from afar while watching the waves hit the shore. Continuing south you&apos;ll come upon Jackson Park (6401 S. Stony Island Avenue), originally planned for in 1871 by the renowned design firm of New York&apos;s Central Park Olmsted & Vaux and later redeveloped by Frederick Law Olmsted and Daniel Burnham as the fairgrounds for the 1893 World&apos;s Columbian Exposition. Take a nature hike through the Osaka Garden (1735 E. Columbia Drive) on the Wooded Island or through the bird and butterfly sanctuary in the Bobolink Meadow. A larger parkland system known as South Park when it was first laid out, Jackson Park connects to Washington Park (5531 S. Martin Luther King Drive) to the west by a grand one-mile boulevard, the Midway Plaisance (1130 E. Midway Plaisance). While much of the north end of rectangular Washington Park is open meadow and fields, the southern half is made up of water in the form of two lagoons. Stroll around and cross the narrow bridges to explore the wetland plants along the shores and maybe get a peek of the bright green monk parakeets that call the Hyde Park neighborhood home. 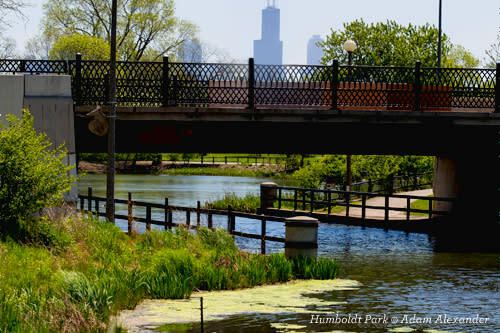 On the city&apos;s Northwest Side, surrounded all around by concrete city blocks, Humboldt Park (1440 N. Humboldt Drive) covers 219 acres with verdant grounds, a large winding lagoon and a gentle prairie river. From the historic rose garden to the wetland shores bursting with wildflowers and native vegetation, you&apos;ll discover a truly serene setting in the heart of one of Chicago&apos;s most culturally diverse communities. Sometimes referred to as Chicago&apos;s "Emerald Necklace," the city&apos;s historic boulevard system is one of its finest examples of visionary urban planning, one that realized the value in incorporating green space. The formation of Chicago&apos;s park and boulevard system began in 1869 and was the first of its kind in the country. The expansive network is made up of 8 major city parks, linked by 19 tree-lined boulevards and 6 grassy squares in a continuous arc approximately 26 miles in length. 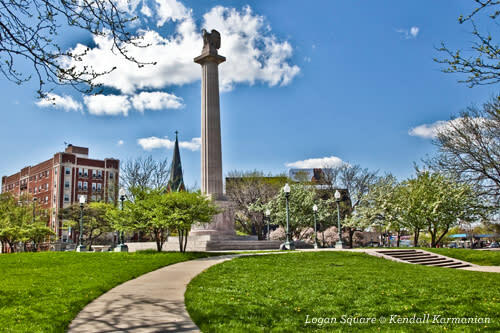 Hop on your bike or just stroll such popular sections as Logan Boulevard, Kedzie Boulevard and Palmer Square — charming areas dotted with handsome greystone homes, restored mansions and majestic churches.